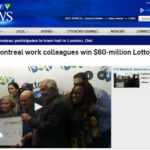 Latest news about Canadian lottery winners, and the Canada lottery. 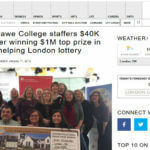 A group of 25 workers from Fanshawe College celebrated on Thursday after claiming the top prize in the Ontario Dream Lottery. The jackpot is normally a choice of two $1.4 million homes. As if to prove that syndicate play offers the best chance of winning, a group of people, colleagues at work, have won a very significant lottery jackpot. How does a lottery win change a man’s life? Watch this man describe his surprise and his plans for his windfall. When Gary Mahon bought a Super Set for Life at Marie’s Mini Mart early one morning, he did not know it would be a life changer. Margaret and Gerald Stewart had played the lottery in various syndicates at their workplaces for about 40 years without winning anything more than $100. But they patiently continued playing even after they were both retired. 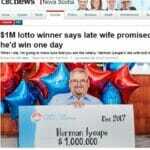 Herman Iyoupe always said he’d win the lottery and for a long time he never did. So before his wife died a year ago, she said when she’s up there she’d make sure he won, so people won’t laugh at him anymore. A man had such a happy family life that he considered himself extremely fortunate even before bagging a $16.7 million 6/49 lottery win. With a loving wife, and a close-knit family that includes children and grandchildren, Clifford Britch had everything he needed. 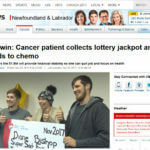 This week a couple who thought they’d won a lucky dip discovered their blessings were so much more, and a Canadian man who deferred scratching his instant ticket won the $1.5 million top prize. Woman Gets To Keep Her Life And Her Money! You’ve probably heard robbers in movies ask their victims to choose between their money and their life. Happily, a prayerful lottery player from Canada has just learned she gets to keep both! Watch how a jolly group of good neighbors describe a life-changing lottery win. The biggest group of lottery winners living on the same street in Garson, Ontario descend on the Lotto Max offices to claim a $10 million jackpot. When couple Imogene Blake and Anthony Baptiste bought a lottery ticket from Wilson Variety on Wilson Avenue in North York, little did they know it will change their lives profoundly.